The second round saw Malaysia paired against one of the three Indian teams. 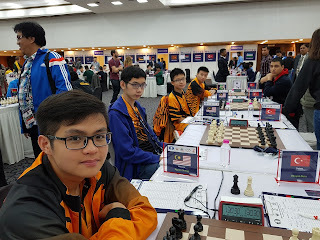 In terms of ranking and ratings it would apear that there was a huge gulf in terms of strength but in round one I had watched a promising but not yet strong Thailand keep the India Blue team at bay for a long time, even getting a half point in the end, and so realised they were vulnerable. Self belief is very important and looking our match up I was sure we should have two points for the draw in the bag should our players play to their ability. But whether we could get the 3-1 win would depend on whether our other two players could overcome their personal demons, and in the end we had to be happy with a 2-2 result which waa good enough for most, some even calling it a big upset. Yes, we are good enough. We just need to get on to prove it more often!